In order to mark its diamond jubilee, the Bangalore Medical College and Research Institute (BMCRI) is showing its generosity, and celebrating its diamond jubilee spirit with people by offering a free bone marrow registry. To mark this special occasion of BMCRI’s diamond jubilee, a commemorative postal cover is being launched by the India post. Also, a Continuing Medical Education (CME) programme will be held from December 25 to 27. The free registry initiative is funded by the Bangalore Medical College Development Trust (BMCDT) and the Infosys Foundation. 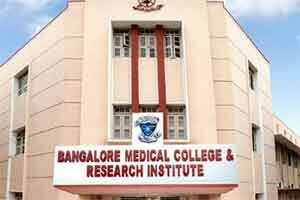 The BMCDT will do the HLA typing free of charge, its chairman Dr K M Srinivasa Gowda told reporters here on Tuesday. Initially, the HLA typing data of 10,000 registered donors will be supported by the registry. It already has 6,000 registered donors. BMCRI also plans to have a bone marrow transplant unit. “In India, it is estimated that 1.3 lakh people need to undergo bone marrow transplants every year. But only about 500 can afford it. Just the HLA typing costs Rs 10,000-15,000,” he explained. To have donors registered, camps would be conducted in other districts and states, he added.